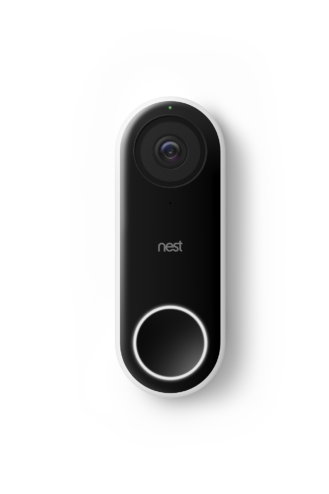 Nest has various cameras that are just cameras, but the company now has a camera that's also a doorbell. Nest Hello is going on sale early next year and aims to keep an eye on all the comings and goings at the front door. It includes several features from the high-end Nest Cam IQ, but it also includes new functionality suited to a doorbell. The Nest Hello records in 4:3 HD video with HDR, which you can stream live to the Nest app. With a Nest Aware subscription, it records and stores videos whenever it sees motion. Without a subscription, all you get are still frames for review. The Hello has a backlit button at the bottom and a camera lens at the top. Hopefully that blue LED is enough to prevent people from mashing your camera lens thinking it's the button. Nest didn't go into detail here, but we believe it is wired directly into existing low-voltage doorbell systems for power. That might explain an unusual omission; Nest Hello doesn't appear to have night vision. Nest's site claims the Hello offers "bright, crisp images day or night." We've confirmed with Nest that the Hello does have night vision via standard IR illumination. For whatever reason, this was not included in the announcement. The person detection features from Nest Cam IQ are offered here (with Nest Aware), so the camera can recognize people and alert you appropriately even if they don't ring the bell. Meanwhile, the Nap Time mode can stop the doorbell from ringing altogether, so it doesn't disturb your nap. Instead, the Nest app just pushes a notification. The doorbell supports 2-way audio, but you might not always want to have a conversation. Thus, there's a feature called Quick Responses for creating canned voice messages that can be triggered with the press of a button. Nest didn't provide a price for the Hello doorbell at the event, nor do we have a specific release date. It'll be available at some point in the first quarter of 2018.